U.S. Air Force Pararescue is the most skilful and capable rescue force in the world, taking on some of the most dangerous rescue missions imaginable. PJs (short for para-jumpers), are members of an elite unit whose commando skills are so wide-reaching they often seem like something out of science fiction. 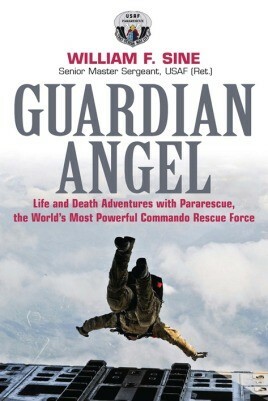 Unfortunately, due to sales rights restrictions, we cannot offer Guardian Angel for sale in your country. U.S. Air Force Pararescue is the most skilful and capable rescue force in the world, taking on some of the most dangerous rescue missions imaginable. PJs (short for para-jumpers), are members of an elite unit whose commando skills are so wide-reaching they often seem like something out of science fiction. They routinely tackle perilous operations that are beyond the capabilities of other rescue organisations, and sometimes dare the seemingly impossible. Since their inception in 1947, PJs have saved more than thirty thousand lives. They can pluck near-frozen climbers off jagged mountaintops as well as recover shot-down jet pilots stranded deep in hostile territory. In the dead of night, the PJs parachute into ominous black waves that loom twenty feet tall to save distressed seamen, and brave the cruellest and most desolate deserts to recover victims. U.S. Air Force pararescuemen have played a prominent role in every armed conflict since the Korean War, rescuing thousands of soldiers from behind enemy lines. Guardian Angel provides a rare glimpse at a PJ’s mind-blowing adventures. You follow Sgt. Sine’s trek across exotic lands and share his encounters with mysterious cultures. Learn what it takes to lower from a helicopter onto the slippery decks of storm-tossed ships to rescue dying sailors. Feel what it’s like to be caught in the middle of a bomb blast so powerful that it tears high-rise buildings in half, and flattens armoured vehicles hundreds of yards away. Soar high above towering jungle trees and experience the danger of swinging on a slim cable below a helicopter while performing a mid-air rescue of a pilot, dangling from his chute a hundred feet above a mountain slope. Go to war in Afghanistan and parachute onto a nocturnal battlefield surrounded by land mines to help a mortally wounded soldier. This is a deadly serious business: when things go wrong, they can go terribly wrong. Aircraft crash into mountainsides, killing all onboard, while some PJs live through horrendous helicopter crashes only to struggle with freezing temperatures, snapped limbs and torn flesh in a desperate fight for survival.